Action from the Wisbech v Holbeach FA Cup tie. Peterborough Sports boss Jimmy Dean has challenged his knockout kings to claim more notable scalps. The ambitious city side are making thrilling progress in their return to the FA Cup after a 93-year absence. 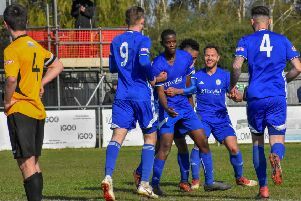 They’ve already dumped out two higher-level sides after following up success at Eynesbury Rovers with an impressive 5-3 triumph at Newmarket Town last Saturday. Avelino Vieira struck four times in the latter victory with Jordan MacLeod also on target to earn a crack at Southern League Premier Division side Hitchin on September 12. But before then they switch their attention to another higher-level challenge in the opening round of the FA Vase when welcoming Sleaford Town to PSL this Saturday. Dean said: “I could not be more proud of the players. “The lads have already done brilliantly to beat two Step 5 teams and we are relishing the challenge of playing another side from that level in the FA Vase. “I would love to have a good run in the Vase after doing so a couple of times as a player. Sports also managed a midweek victory in the Hinchingbrooke Cup. Vieira came off the bench to hit two crucial late goals in a 3-1 first round win at St Neots Saints. Sports were one of four local sides to make FA Cup progress last weekend. Yaxley, Deeping, Holbeach (at the expense of Wisbech) and Spalding were others to advance to the first qualifying round when Stamford AFC also enter the competition. It was also a good Saturday for Peterborough Northern Star as they collected a first win of the campaign. Jacob Joyce’s solitary strike earned a United Counties League Premier Division victory at Wellingborough Town. Star face one of their former bosses this Saturday when Michael Goode’s Deeping side visit the city.